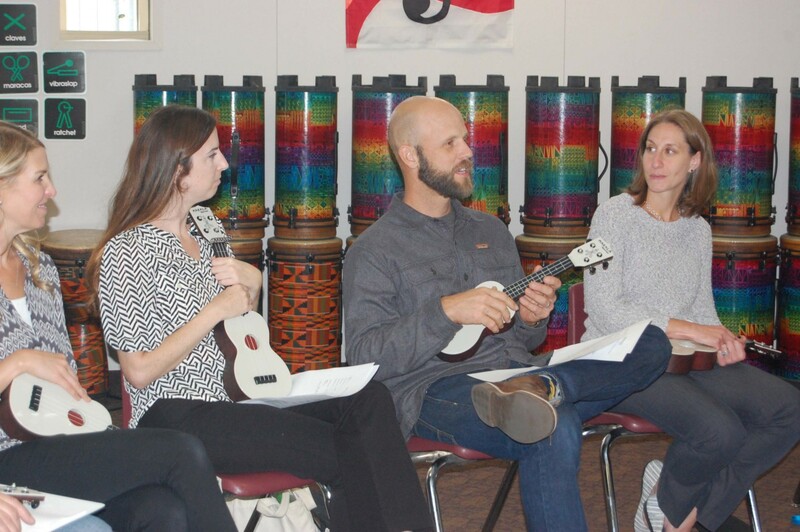 COAST CITIES — Teachers in local school districts are learning to play the ukulele and guitar with a goal to not only potentially pass that knowledge onto their students, but to also integrate music and songwriting into their academic lessons. “The incredible thing is that these teachers are volunteering their time to learn,” said Jessica Baron, who founded Guitars in the Classroom in 1998 as an experiment to show teachers how to make music, lead music for learning and write songs with students to enhance learning in all subject areas. Participants also learn how to select or create songs that fit into the lessons they plan to teach. Baron began playing the guitar when she was 6 and started teaching at 12. She has a background, degrees and experience in childhood development, marriage and family counseling and clinical psychology. She’s also worked as a performer. While working as a music teacher she said she often heard colleagues say they wished their students were as excited about math as they were about music. Teachers meet one hour a week for eight weeks. Classes are generally divided into upper- and lower-grade educators, but that, too, is flexible. “We shape what we do to fill their needs,” Baron said. Classes are capped at 24 participants but Baron tries to limit enrollment to 15 or 20. Lessons usually start with the ukulele and then move to guitar, depending on supplies. All teachers receive instruments on a long-term loan. They can keep them until they retire or buy their own. Erik Johnson, a sixth-grade teacher at Skyline Elementary School in Solana Beach, played “Riptide” by Vance Joy on the ukulele for his students. The next day, 10 students brought ukuleles from home, he said. Through a crowd-funding campaign, Johnson secured funds to buy instruments for the rest of the class, which recently performed for the school. Johnson is crowd funding again to buy a set of drums. He said he plans to ask students to create a song rather than a PowerPoint presentation for his next science unit. She’s been using the ukulele during transition times and is “open to anything” when it comes to future use. Jordan Einbinder uses rhythm exercises and music to make rhythm part of his fifth-grade classroom routine at Solana Ranch. Allison Lazerus is currently trying to raise money for instruments so she can teach music to her sixth-graders at Solana Santa Fe in Fairbanks Ranch. A recent class started with participants taking a deep breath in before sharing a music experience from the previous week or two. Three teachers said they practiced together during sixth-grade camp. In addition to having his students perform for the school, Johnson attended a Steven Van Zandt concert. Guitars in the Classroom is based in San Diego, with programs in 32 states and Canada. Locally it is funded by the Mizel Foundation in Encinitas and the Betty Scalice Grant, which is part of the Coastal Community Foundation. The program works in partnership with school districts to provide qualified music instruction for all students. “It’s a team effort with real participation from the district office,” Baron said. Solana Beach classes are underway. Teachers, administrators or support staff from Encinitas Union School District are invited to participate in the next series, which will be held Saturday mornings from Nov. 11 through Jan. 27, with no classes during the holiday weekends, at the Farm Lab on Quail Gardens Drive. Register at https://www.surveymonkey.com/r/GITCregistration. Previous music experience is not required.